Here's a summer photo for a day. 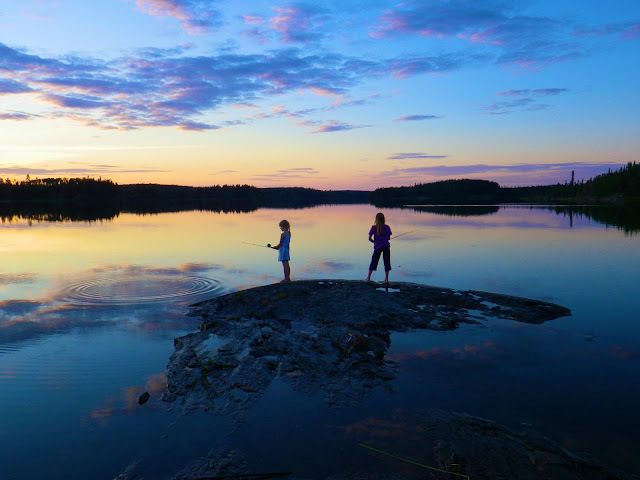 I love this photo of my daughters, it captures their characters well (one in a pretty little dress while fishing, the other in practical camping clothes). This picture was taken in 2012 on an canoe and kayak family camping trip on Amisk Lake. The kids, fishing on Echo Island, Amisk Lake, Saskatchewan. Paddle Canada has made a name change for one of it's programs. The Paddle Canada Introduction to Kayak Skills course is now simply named Basic Kayak Skills. The change was made to make things consistent with the other Paddle Canada programs (canoe, SUP, river kayak), and to keep it simple. It is just a name change, but it will affect the names of the courses I offer in 2014 and beyond. So, if you are looking for the Introduction to Kayaking Skills courses that I have been offering in past years, it's now Basic Kayak Skills, or just Basic Kayak. Same great program, just a more basic name. Thanks to Philip.AK who posted on the westcoastpaddler.com forum a link to the stunning video he made from his recent paddle from Kodiak to Homer in Alaska in 2012. It looks like it was a stunning trip, and he put together a brilliant video that I wanted to share with you here. The video is 21.5 minutes long and worth every second. Watch it in HD and full screen if you can. Sea Kayaking from Kodiak to Homer from Philip Tschersich on Vimeo. For some reason I suddenly have a strong desire to head to south central Alaska to paddle! Wow, 2013 turned out to be a great year for Coldspring Paddling Instruction! Here are some of the highlights from the past year. In the summer of 2013 we introduced a new course just for kids. Following on the success of my Parents + Kids courses, I wanted to run a course that just focused on the kids. The course went great and we had some fun. Look for more of these to be offered in 2014. This year I taught a couple of courses with Carla Punshon & Jeff Roe, two great Saskatoon sea kayakers and both great Paddle Canada instructors. Both are involved in building the paddling community - Carla starts them young through Girl Guides, including teaching my daughter during a camp. Jeff creates connections among kayakers and organizes informal events for us to work on our skill development. This was the second year offering the Paddle Canada Level 1 course and we had a blast this year at Candle Lake again. Great weather, great and eager students, and time to work on some neat stuff. It all adds up to tons of fun on the water. New for 2013 was a casual evening paddle/course on the South Saskatchewan River, specifically for those that have previously taken my courses. This offering was a huge success and I will be doing more of it in 2014. It was a great chance for those that have taken a course, but maybe aren't that comfortable yet on the river, to give it a try with the reassurance of having an instructor at hand. Hopefully you hardly even noticed, but I installed a new course registration system on the website last winter. It worked very well, despite not smoothly handling courses being held in multiple locations. Number of times I was rolled in the Florida surf: lots! I have a few things in mind for 2014, including pool sessions in the winter, more skills-based clinics (rescues, etc. ), and more kids courses. I'll also try to run something with yoga next year but I'll do it differently than what I tried this year. I love the north and so really hope to be able to offer some courses this year up near La Ronge. Another couple of items on my agenda are to get out west for a symposium and more training. So, stay tuned as we plan for another great year!